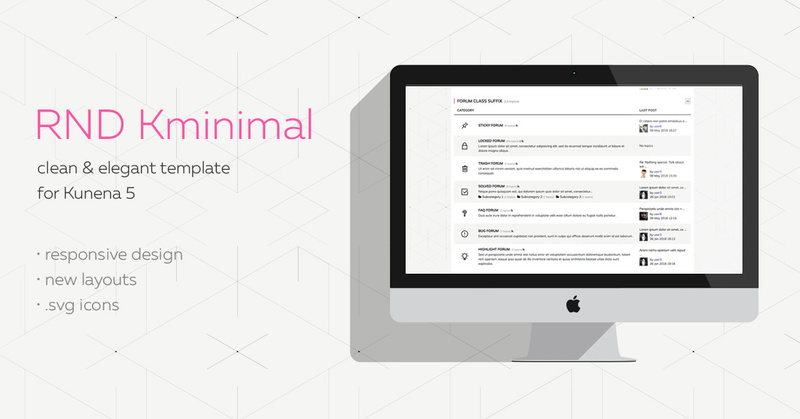 Today we are glad to introduce an update of RND Kminimal - an ascetic template in minimalistic style which is compatible with Kunena 5.1 now. Feel free to get the latest version of our nice template and update it on your site! All major issues were fixed as well as we implemented improvements to get the best result with Kunena 5.1.6. Moreover, Kminimal uses Font Awesome 5.4 markup and still has Bootstrap 2 version. Joomla template and Kunena module styles as well as kickstart were deprecated and excluded from the distributive package now. Warning! All template settings will be overridden after the update. If you changed some settings (params, colors) - you will need to set them again. Please, remember these settings or copy configuration file. Read more: How to update Kunena template. We go on working on updating other templates from our series soon to be released. Watch for our news!